Happy Father's Day to all the great fathers out there! I hope you are all enjoying your Sunday! This was Scott's first official Father's Day and so, of course, we had to celebrate! This morning David woke up around 7 am ready to start the day. Unfortunately, Dad was still pretty sleepy since Sundays are one of his only days off. So we let him sleep in and we got started on all the great Father's Day stuff we had planned. Step One was to make dad a card. As it turns out, David is still a little young for this activity! When he got mad at me for stopping him from eating the markers, we decided it was probably best to move on to Step Two: Breakfast. Banana Bread French Toast with Homemade Caramel Syrup! I decided to top the french toast with my all time favorite syrup, which is a copycat recipe for Kneader's Caramel Syrup and it was definitely a hit! Scott loved it (almost as much as I did)! Mix eggs, milk, cinnamon, and vanilla in shallow bowl. Put all ingredients directly into a small saucepan on medium heat stirring occasionally until smooth and caramel in color. I hope you enjoy this super simple & delicious recipe!! Let me know how it turned out! Happy Father's Day! Thank you! Yes, this is a delicious and easy recipe! Your girls will love it! Let me know how it turns out! Oh my gosh, that looks amazing. 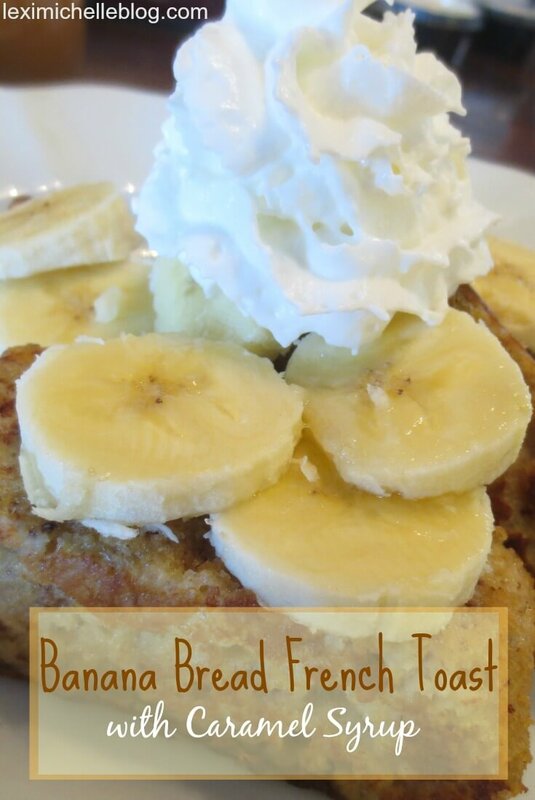 I love banana bread and I love french toast - how did I never put 2 and 2 together? I can't wait to try this recipe out this weekend. P.S. Found you on the Link It To Me Link- Up! it is definitely a great combination, I promise you! Thank you for stopping by! Oh these sound great! Thanks for linking up to the Bloggers Brags Pinterest Party. I have pinned to the Bloggers Brags Broad. Featuring your recipe on Monday! Thank you for the feature! It is definitely one of my favorite recipes! I love banana bread French toast, this sounds delicious and your little one is precious! Thanks for sharing at What'd You Do This Weekend? I hope you will join us again next Monday! Thank you! I missed this Monday (computer issues), but I will be there next week!